1) The serial number is 55xxxxx. Found some website via Google say that the production date was 78-79. But I was told by my friends that the 16014 was produced in 80-90. Should I be alarmed here? Is the later produced 16014 better than the earlier ones? 2) My wife and I are a strap person, especially with the non-sport models. I bought her an aftermarket white calf leather right away. 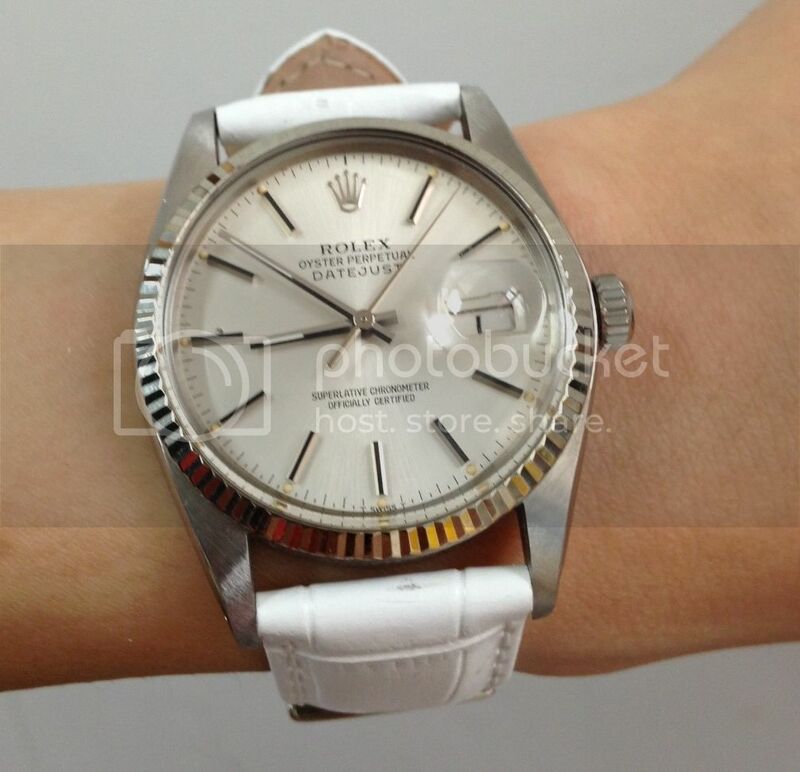 But as you can see from the photo, the strap is way too long for her small wrist. Do you know whether I can buy quality strap with shorter length? Do you know good source of deployant bucket as well? 3) How do you feel about the condition of the watch. (not sure if you can tell from this crapy iphone photo though) The seller told me it was "excellent" and zero polish was done and everything is original. What do you think? BTW, there is a dent on the plastic crystal at 9 o'clock. They promised to replace a new exactly same crystal for me. Next Topic: My 5513 went to RSC/Dallas with at 1520 and came back with a 1570 mvmt.